Oftentimes when you are sharing a URL on Facebook, Twitter, and LinkedIn, the preview may appear different than you'd expect. It's often due to a caching of a previous version of that URL by social networks. This article will walk you through how to add Open Graph tags to your page or site so you can have more control over your preview. The Open Graph protocol creates a way for pages to deliver content that can be added to a social graph. Facebook, LinkedIn, and other platforms use this information to generate previews of pages that match other types of content (such as posts, stories, etc.). This is done by adding meta tags to the <head> section of any web page. Our Drag & Drop Builder includes the option to easily customize the information Facebook uses to generate a preview when you (or one of your customers) posts your page or site to their Timeline. As a bonus, other social media sites can often use this information as well (such as Twitter). Below, you can find the steps needed to customize the information for social sharing on your pages and sites in our Drag & Drop Builder. Open the Tracking settings for your page or site, and choose Facebook. You can enter the title, description, and upload a photo that will appear in your Facebook share preview. To learn more about each setting, you can mouse over the question mark icon. PLEASE NOTE: Images must be 200px × 200px at a minimum to be used for the Facebook preview. For best results, it's recommended that your image is at least 600px × 315px. In our Legacy Builder, you'll need to edit the Open Graph tags yourself, then paste them into the tracking section of your Standard Lead Page. Once you have edited the code accordingly you can copy it and place in the Tracking Code section of your Lead Page. Paste the code in the Head-Tag Tracking Code section. You can access Facebook’s Debugger here: https://developers.facebook.com/tools/debug/ Once there, paste in the URL for your page or site and click Debug or Fetch New Scrape Information. You should then see your a preview of what users will see when sharing your page or site on Facebook, as shown below. That’s it! 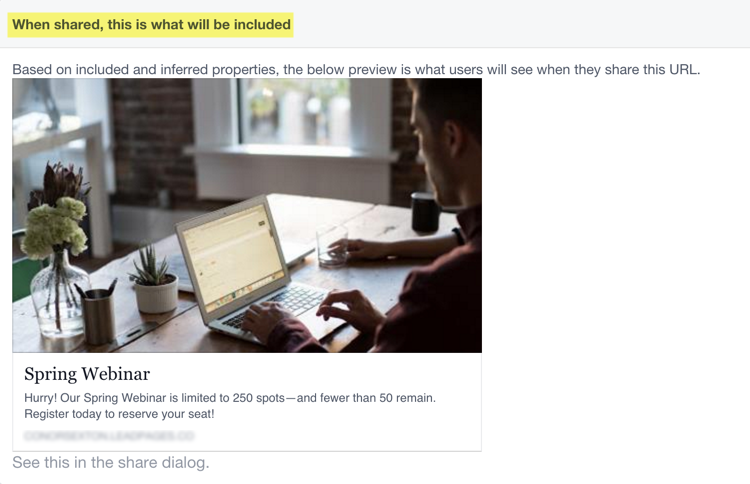 Your preview should now reflect the information you've customized for your page or site. Content shared on LinkedIn is cached by LinkedIn’s servers for about seven days, so a new preview won’t be generated right away when you update meta tags for LinkedIn. However, there are a couple of steps you can take to try and update your preview immediately. LinkedIn has its own debugger of sorts called the Post Inspector. Paste your URL here, then click Inspect and your LinkedIn preview should reflect your updates. You'll want to refresh LinkedIn within your browser before posting your link. If using the inspector doesn't work, you can alter the URL by adding a query parameter, and LinkedIn should treat the link as a new source. Sharing the modified URL should ensure LinkedIn uses any new meta tags you’ve added. Twitter uses different meta tags called Twitter Cards. These cards can also be added to the tracking code section of your page or site along with the Open Graph tags. For more information and instructions for Twitter Cards please visit: https://dev.twitter.com/cards/overview. When sharing a link to a URL via text message, most smart phones will pull in a preview image of the page or site. This is true of Leadpages and by simply editing the Facebook preview and updating your page or site as indicated above, mobile messengers (i.e. iMessage, Android Messages) will share the correct preview image you've selected.